My husband has a mustache and goatee and I honestly don't know how many trimmers we have had to purchase over the years. Having a nose and facial hair trimmer that gives a nice, close trim without pulling the hair is very important. ToiletTree Products set out to make a high quality nose trimmer and they did just that. They avoided the common cheap plastic body that often cracks and breaks and instead designed their trimmer with a high quality steel casing. 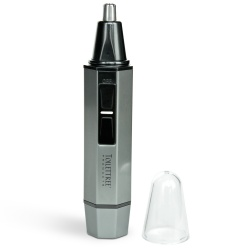 Right out of the box, you will feel the difference and quality of this nose and facial hair trimmer. As an added bonus, the water resistant design allows you to safely use this trimmer in the shower and makes for an easy rinse off. The super bright LED light is a huge help when trying to find those pesky, hard to reach nose and facial hairs. "The rotary cutting system allows hairs to enter the trimmer tip from the top and also from the sides which is very helpful for stray hairs not only in the nose but also on your eyebrows, beard and ears. Our stainless steel high quality blades provide you with a clean smooth cut. You will never have to worry about this trimmer painfully pulling hairs due to the high quality." The ToiletTree Products Professional Water Resistant Heavy Duty Steel Nose And Facial Hair Trimmer with LED Light is sure to be a huge hit with the man in your life!